For some reason fall planting garlic around here is insanely expensive, like $30 to $50 per pound. I really don’t understand why it costs so much, seeing as regular grocery store garlic can be had for pennies per pound. Maybe the varieties are super special? I don’t know. Anyway, when I moved here there were a few garlic plants growing here and there, I didn’t know what they were until they started sending out scapes. I left them alone and they developed garlic bulbils, which I’d never seen before. They kind of look like tiny garlic bulbs, hence the name. So I had a handful of bulbils and I thought I would give them a try. I popped them all into a pot around September, and they did very well. 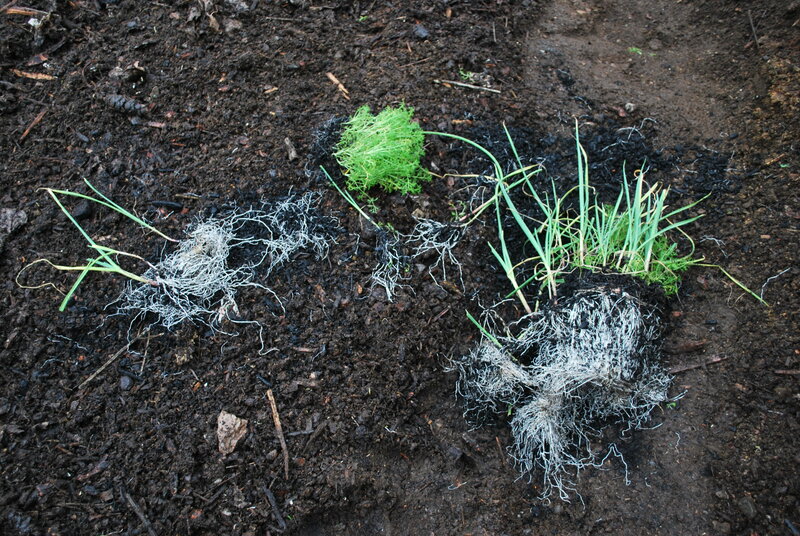 Sending up long green shoots and filling out the pot with plump, white garlic-scented roots. Since we still haven’t had a killing frost here on the island, I wanted to get them in the ground to see how they’d do over winter and come spring. I was able to put in 45 young plants today along with a bunch of chamomile that had sprouted alongside them in the pot. Not a bad upgrade from just a few wayward plants. I look forward to seeing how they taste compared the fancy kinds. Garlic is pretty much garlic, is it not? This entry was posted in gardening and tagged bulbils, garlic. Bookmark the permalink.